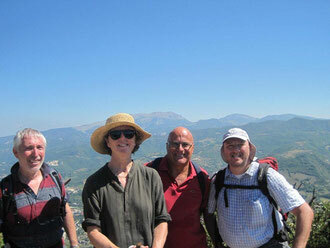 I've mentioned in a previous blog the great walk I had with Dino Gazzani as the guide. Below is his calendar of walks for December, 2012. Personally, I fancy the CIOCCOLATO IN TOUR at Tolentino. Sunday, December 2: MONTE S. VICINO from Elcito. From perched and lonely village near S. Severino Marche (MC) tothe highest peak feature of this stretch of the Marche Apennines. Estimated time: 4,00 h-4,30 h (excluding stops). Gap: 600m. Diculty: E.
Sunday, December 9: MADONNA DEL SASSO HERMITAGE AND MONTE FIUNGO. From Valcimarra of Caldarola (MC)to Monte Fiungo top through the Hermitage at the entrance of River Chienti High Valley, along the eastern borders offormer Camerino Dukedom. Estimated time: 4,00 h-4,30 h (excluding stops). Gap: 750 m. Diculty: E.In the aernoon, CHRISTMAS MARKET AT CALDAROLA (MC) and/or CIOCCOLATO IN TOUR (CHOCOLATE TOUR)AT TOLENTINO (MC), a dip in cocoa and its delights!! Sunday, December 16: SNOWSHOE WALK IN VAL CANATRA. From Castelluccio of Norcia (PG) to Poggio di Croce,going up the side valley of Pian Perduto to admire the winter scenary of its Piani. Estimated time: 5,00 h-5,30 h (excludingstops). Gap: 500 m. Diculty: E.
Sunday, December 23: SNOWSHOE WALK ON PIANI DI RAGNOLO. From S. Maria Maddalena to Punta del Ragnolo,natural balcony overlooking the southern Marche over Sarnano (MC). Estimated time: 3,00 h (excluding stops). Gap: 300m. Diculty: E.
Monday, December 24: INFERNACCIO AND S. LEONARDO HERMITAGE for Christmas Eve Mass. From From the gorgedug by the River Tenna to the saddle where the hermitage rises, for Christmas Eve Mass. Time of going: 1.15 h-1,30 h,return 1.00 h-1.15 h. Gap: 285 m. Diculty: E.
Wednesday, December 26: GROTTAFUCILE HERMITAGE AND MONTE REVELLONE. In the heart of Rossa Gorge, onthe calcareous ramparts that bar the River Esino course. Estimated time: 3.30 h-4.00 h (excluding stops). Gap: 660 m.Diculty: E. In the aernoon, GENGA LIVING NATIVITY, in the Frasassi Gorge: the larger representation of Nativity in the world along the path that leads to Frasassi Sanctuary. Friday, December 28: EVENING SNOWSHOE WALK ON PIANI DI RAGNOLO. Sunset on the Piani waiting for the fullmoon. Estimated time: 3,00 h (excluding stops). Gap: 300 m. Diculty: E.
Saturday, December 29: SNOWSHOE WALK AT PANTANI DI ACCUMULI. From Forca Canepine to Monte dei Signori,on animal tracks. Estimated time: 3,30 h-4,00 h (excluding stops). Gap: 200 m. Diculty: E.
Sunday, December 30: SNOWSHOE WALK AT FORCA DI PRESTA. On the hills surrounding the Pian Piccolo, with spectacularviews on River Tronto High Valley. Estimated time: 4,00 h-4,30 h (excluding stops). Gap: 500 m. Diculty: E.
Professional Guide empowered by national and regional regulations and covered by R.C. insurance.Note: this calendar may be changed because of adverse weather conditions. Snowshoe walks will be made only if snow conditions of the selected places will be satisfying. Any possible changes and new itineraries will be promptly communicated.